While tasting the menu of Julie&Julia, we tried to take some photos of ourselves enjoying the delicious food. Well, every photo looked horrible. Not because WE look terrible – we always look great - nor because we can't take photo's, but simply because the action of spooning the food into our mouths looked horrendous. That open mouth, that train wreck in your mouth, those close-up nostrils... It’s everything but tasteful. Which made us wonder: how do actors eat their food in a foodfilm as Julie&Julia? Actually, most of the actors in films don’t really eat. They put a spoon or fork in their mouth but they actually chew away air. Sometimes we can even see actors drinking from empty cups of tea, or they keep their cup in a certain angle, so we can’t see the cup is empty. This is perfectly done in this clip of Modern Times. Film, after all, it is a make-believe world, so why bother? In Julie&Julia most of the food seems to be actually eaten. To avoid looking into a wide mouth, there are several tricks the actors use. Notice that a lot of food is quite big, covering the actors mouth. Or as a variation, they simply keep their hand before their mouth, blocking off any intestinal view. This technique is profitable for both sides: you see the actor, (but not his/her mouth) and you do see the delicious food, in the same shot. Sometimes the actor tilts the food extra towards the camera, to really show off the food. Keep your mouth closed at any time and make the passage of the food through your mouth extremely short. Looking at Amy Adams and Chris Messina eating away a bruschetta is truly skillful. They both open their mouth very briefly and they not only seem to really chew their food, but also talk while eating. And it still looks appetizing. When eating food in film, it’s not about your mouth, it’s about the food. And you can play a lot with food. Putting spaghetti on a fork is a favorite thing among actors, but also breaking lobsters, sprinkling salt and pepper on food or simply fool around with food. Amy Adams in the video here above uses her forked piece of food as a pointer while talking about Julia Child, underlining the importance of food to the content of her exposé. In this nice shot, Julie&Eric (Amy Adams and Chris Messina) drink the same at exactly the same time. It’s a social thing, doing things simultaneously makes us one and that’s why we love Cinema Culinair. But notice that we - the viewers - get two shots of the action at the same time: en face and en profile. Two shots for the price of one! You don’t see this often in film, actually only when people are smoking, drinking or eating. 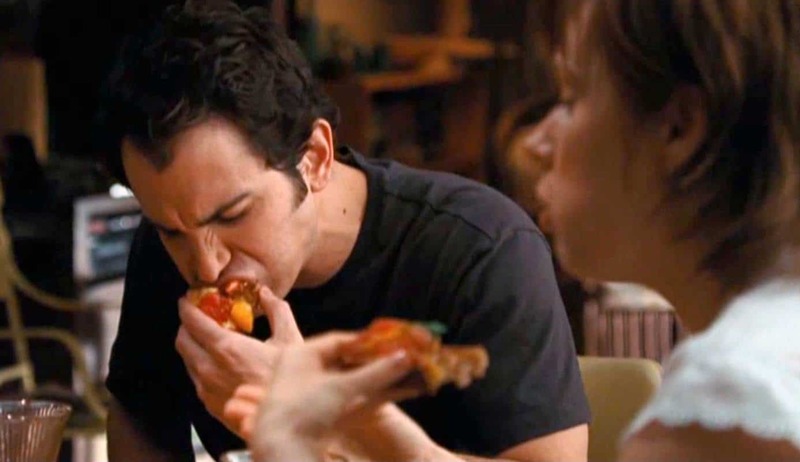 Tip 6: Chris Messina leaning over his bruchetta, showing off the food and hiding his open mouth. 6 It's the angle, stupid! To avoid looking into the abyss of your open mouth, tilt your head and the camera down. This also makes the food more attractive then frontal views or side views. When all else fails, the camera(wo)man should film en profile, keep a safe distance in a wide shot or as a last resort, the editor can simply cut away the ugly moment of truth.